The smell of sugar laces the air inside Bamford Bakeshop. The Scappoose bakery was opened in 2017 by young entrepreneur Megan Bamford. 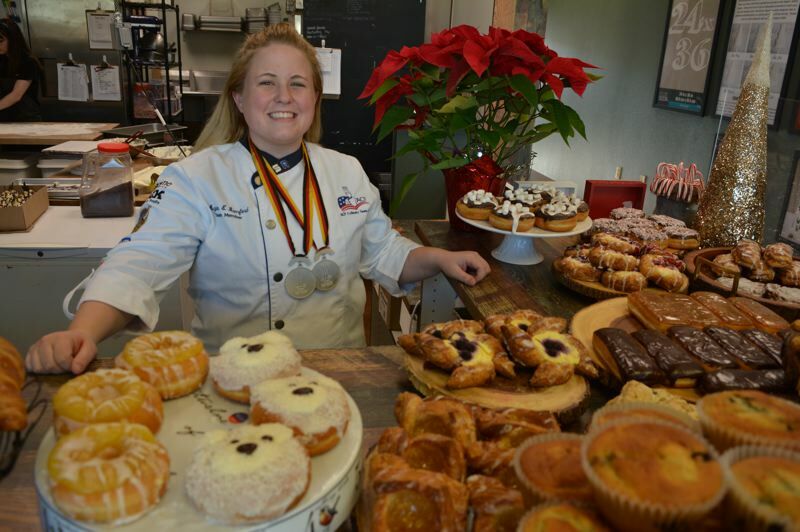 Just over a year after fulfilling her dream of opening her own bakery, Bamford brought home two silver medals after winning second place with Team USA in the 2018 Villeroy & Boch Culinary World Cup on Nov. 28 in Luxembourg. The past few years, months and even hours have been a whirlwind. Bamford, 25, runs a fast-paced business. Her phone shows nearly a dozen calls she's made before noon. Behind the counter, a bakery employee notifies her that a customer wants a cake order moved up by a few hours. The stress of her quaint bakery isn't unlike the pressure of competing in an international cooking competition. The Rainier High School graduate says she tried out for the USA culinary team in 2011, when she was enrolled in Oregon Coast Culinary Institute. It was an ambitious move, but one she knew she had to try. "I was 17 ... and the team practiced at the culinary school I was at," she recalls. "I was like, 'I want in.'" When she turned 18, she was one of about 200 people who tried out for the team, but one of less than 10 who earned a spot. "A lot of people helped me get to that spot," Bamford says. She started out at the bottom, washing dishes for the team and serving as support. By 2016, she and the team had competed in roughly 40 competitions and she decided her time on the team had run its course. That changed just a month before the 2018 World Cup competition. "They had a situation with the pastry chef on the team," Bamford says. "She wasn't going to be able to compete." Her former teammates asked Bamford to step in. Together, her nine-person team created display pastries and full-course meals for both hot and cold categories of the competition. Overall, the team placed second, earning silver medals. Back at her bakery, an industrial-grade mixer clacks against the bowl with each rotation. It's the sound of success — for Bamford, who says she knew at a young age she wanted to pursue a culinary career. "I was born, and then I knew what I wanted to do," the bakery owner jokes. "It's in my blood." She grew up baking with her mother and grandmother and says all of her childhood birthday cakes were made by her mother. "My parents didn't push me, but they really encouraged me to do the best I could with it," she says. After her successful win in Luxembourg, she will head out to Germany to compete individually and with her team in the 2020 Culinary World Cup.